U.S. Navy reports that five Chinese vessels shadowed and aggressively maneuvered close to the unarmed USNS Impeccable in the South China Sea on March 08. The United States protested the Chinese activity to China’s foreign ministry in Beijing and to the defense attache at the Chinese Embassy in Washington. 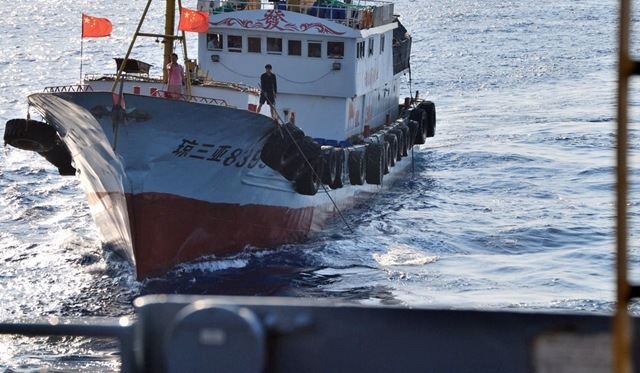 China has rejected the U.S. protests and maintains Impeccable violated international law by sailing illegally within China’s Economic Exclusion Zone of 125 miles. Five Chinese vessels surrounded the U.S. Navy’s Ocean Surveillance Ship Impeccable while conducting routine operations in international waters, 70 miles south of Hainan Island. 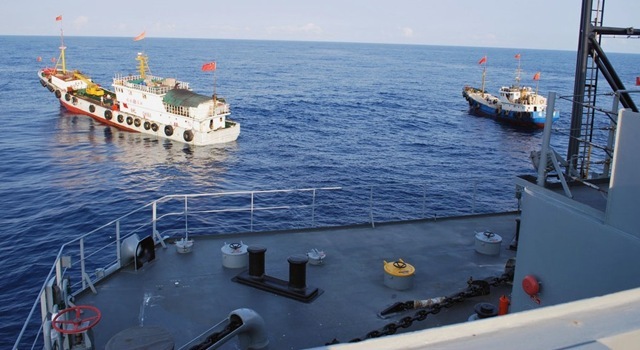 The Chinese ships included a Chinese navy intelligence collection ship, a Bureau of Maritime Fisheries patrol vessel, a State Oceanographic Administration patrol vessel and two small Chinese-flagged trawlers. The Chinese vessels obstructed Impeccable’s passage by dropping pieces of wood in the water directly in the path and two of the ships stopped directly in front of Impeccable, forcing her to stop. The trawlers came within 25 feet of Impeccable, as part of an apparent coordinated effort to harass the unarmed ocean surveillance ship. A crew member on a Chinese trawler used a grapple hook to snag the towed acoustic array of Impeccable. Impeccable’s master used bridge-to-bridge radio circuits to inform the Chinese ships in a friendly manner that it was leaving the area and requested a safe path to navigate. On March 07, another Chinese ship challenged Impeccable over bridge-to-bridge radio, calling its operations illegal and directing the U.S. Navy ship to leave the area or face the consequences. On March 05, a Chinese frigate crossed the bow of the Impeccable at a range of about 100 yards. Chinese maritime aircraft buzzed the ship after that incident. 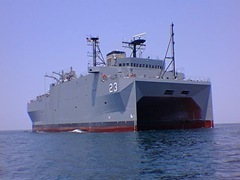 One of the six Ocean Surveillance Ships that are part of the 25 ships in Military Sealift Command’s Special Mission Ships Program. passive detection of quiet nuclear and diesel submarines. real-time reporting of surveillance information to theater commanders. For passive sensors, the vessels employ either a long-line passive sonar acoustic array or a shorter twin-line passive acoustic array. The twin-line system is the best operational shallow-water towed array and the only multi-line towed array in the Navy. It consists of a pair of arrays towed side-by-side from a SURTASS ship and offers significant advantages for undersea surveillance operations in the littoral zone. It can be towed in water as shallow as 180 feet, provides significant directional noise rejection, resolves bearing ambiguities without turning, and allows the ship to tow at higher speed. With a Low Frequency Active (LFA) transmitter suspended beneath the T-AGOS ship as an add-on to SURTASS, the system is capable of making long-range detections of both submarines and surface ships. As a mobile system, SURTASS/LFA can be employed as a force-protection sensor wherever the force commander directs, including forward operating areas or in support of battle group activities. 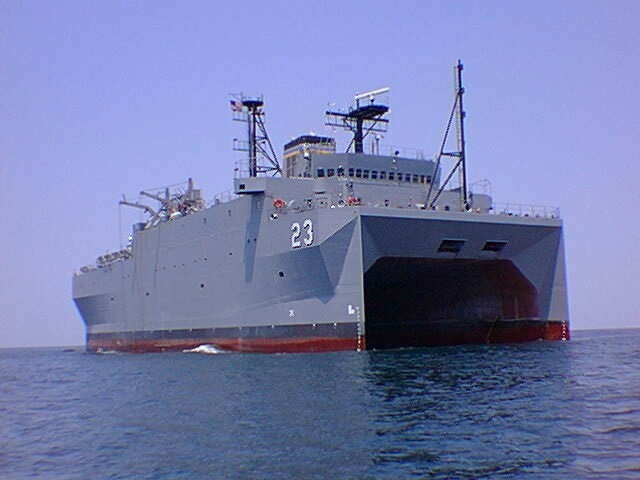 Specifications of USNS Impeccable (T-AGOS 23) are here, (photograph from Military Sealift Command). What is the importance of Hainan Island ? The People’s Liberation Army Navy (PLAN) of China has developed Sanya naval base (also known as Yulin) in the southern part of Hainan Island to operate their new Type 094 Jin-class nuclear strategic missile submarines (SSBNs) and Shang-class (Type-093) nuclear-powered attack submarines (SSN) developed as a replacement to the old Han-class submarines. The submarine naval base is reported to be an underground facility through tunnels in the mountains. Hainan island is also one of the Chinese String of Pearls to have control over the South China Sea. 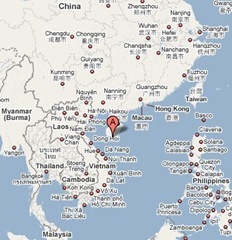 More details on Sanya naval base are at Janes News and FAS Strategic Security Blog. Now it is clear why China wants to keep naval ships of other countries to stay away from Hainan Island. Here are some photographs from U.S. Navy. A crew member on a Chinese trawler uses a grapple hook in an apparent attempt to snag the towed acoustic array of USNS Impeccable. Two Chinese trawlers stop directly in front of USNS Impeccable, forcing the ship to conduct an emergency “all stop” in order to avoid collision. View an interesting video clip “China denies harassment and accuse USA of violation of international law”. Read more from U.S.Navy’s news reports: one, two, three. Read more from Chinese news reports: Xinhua.